Christine Schenk CSJ has worked as a nurse midwife to low-income families, a community organizer, a writer, and the founding director of an international church reform organization, FutureChurch. She writes an award-winning column "Simply Spirit" for the National Catholic Reporter. Her recent book Crispina and Her Sisters: Women and Authority in Early Christianity details original research into iconic motifs of female authority found in early Christian art and archaeology. It is Advent. The season of hope and of the prophet Isaiah who foretells justice and healing for all God’s people. 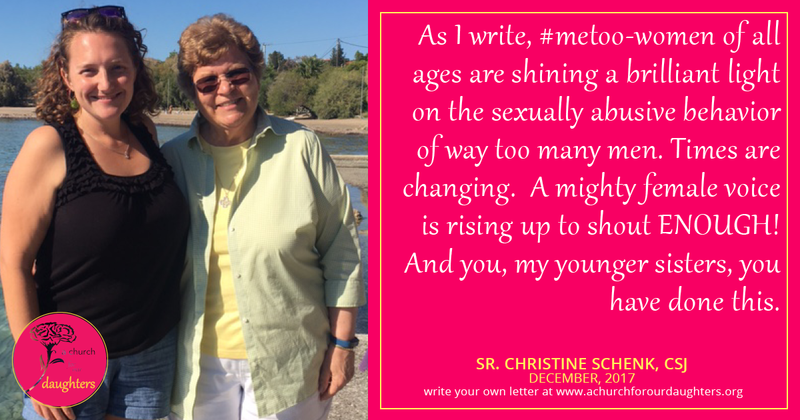 As I write, #metoo-women of all ages are shining a brilliant light on the sexually abusive behavior of way too many men. Powerful men who ruled entertainment, politics, and the media are being called to account for treating women as sexual objects. Harvey Weinstein, Roger Ailes, Matt Lauer, Peter Levine, Al Franken, and scores of other men have been fired or resigned in disgrace. For a woman like me—blessed with the “gift of years”—this is nearly unbelievable. Baby boomer girls were socialized that “boys will be boys” and then schooled in ways to protect themselves. Don’t walk alone at night, keep your legs together, avoid dark streets and stairwells, carry mace, and avoid being alone with any man you don’t know well. (Not that any of that always helped that much.) No one ever confronted “the boys” about their behavior. Among my female friends and relatives, there is not one who has never experienced unwanted advances from a man. But times are changing. A mighty female voice is rising up to shout ENOUGH! We will no longer allow you to disrespect or abuse us. Millennia of nasty male behavior must change – and change RIGHT NOW. Ok, now I want to talk about church. Yes, that Catholic church that denies women full and equal participation in decision making. The one that never challenges men to stop sexually harassing women. Worse, the one that has often blamed women for bad male behavior. That church also has an infrastructure. An infrastructure that can barely function without the 32,000 female pastoral ministers unobtrusively serving the People of God in the U.S. Women ministers who—while they hate it—don’t stress a lot about inequality. All they care about is that God’s people are ministered to. They don’t care who gets the credit. And they put up with invisibility, long hours, and bad wages because they love what they do. You think I’m kidding? I challenge you to read Elizabeth Schussler Fiorenza’s seminal work: In Memory of Her which uncovers the strong female leadership that undergirds our Christian Scriptures and early church history. Or read Elizabeth Johnson’s beautiful book, She Who Is and discover the mystery of God in female metaphor. And of course, Carolyn Osiek and Margaret Y. MacDonald’s A Woman’s Place describes how prominent women in early patronage networks spread the Gospel throughout the Roman empire. Since it is Advent, we must mention Wilda C. Gafney’s Daughters of Miriam a meticulous study of the women prophets in ancient Israel. The school of Isaiah—the pre-eminent prophet of Advent—had many female prophets. The plea I want to make is to ask you to stay in the church—as messed up as it is—and be the change you wish to see. Won’t you stay and help us roar?